This has to be one of the best weeks of my life. I got to see my food writer hero Michael Pollan give his Sun Food Agenda speech at Washington State University on Wednesday for free! It’s only the second time he’s given it, and the talk was incredible and surprisingly well balanced. Pollan excels at storytelling, combining multiple complex situations and tying them together into simple forms that we can take and use. I wish I could have taken you to The Sun Food Agenda with me, but here's a small 15 minute clip to give you a taste. I learned some astonishing facts. Did you know that it takes 26 ounces of oil to produce and ship the meat from a McDonald’s Double Quarter Pounder to us? And that one Midwestern farmer in the 1950s could feed 20 people and his family, and today one Midwestern farmer can feed 150 people? Or how about in 1910 24% of our income went to food, in 1960 18% of our income went to feeding ourselves, and now only about 9.5% of our income does? Less than any other nation, less than at any time in history. Our farmers have gotten very good at producing food, but at a cost. In the 50s for every calorie of oil used, we produced two calories of food. Now, for every ten calories of oil spent, we get only one calorie of food. This can’t go on forever, but there are all kinds of things that can be done. Pollan stated the Farm Bill needs to be changed into a Food Bill. One that supports farmers growing all kinds of crops, not just soy and corn. Pollan also gave examples of what's going right. There are a few organic high tech farmers doing remarkable things right now, and mentions Polyface Farms as one example. You won’t believe the incredible production they have without waste. Basically one animal’s manure is another’s lunch. It sounds terrible, but is fascinating. I’ll keep this short, but if you ever get the chance to sit in on this talk, you must! Do whatever it takes to get there. It’s our food future, and we need to know what’s going on. Now on to the pizza! Linda from Ciao Chow Linda inspires this pizza. Her version is the Italian original, mine is more of an American adaption from stuff I had in my refrigerator. This pizza is so good I wanted to eat it all by myself, but we had friends over. So I was nice and shared a little of it. A very little. A heads up, the potatoes must be soaked overnight before assembling the pizza. Please read all the instructions before beginning. 1. Place the potato slices in a bowl and cover with water. Stir in 1 Tablespoons of salt. Cover the bowl and refrigerate overnight. 2. Make the pizza dough about an hour and a half in advance. Make the sauce as well and set aside. 3. When ready to assemble, place a pizza stone in the lower third of the oven and preheat to 500 degrees. 4. Divide the dough in half and roll out each piece pretty thin pieces about the size and shape of your pizza stone. Place the doughs on parchment paper cut to size. 5. Strain the water from the potatoes. Squeeze out as much water as possible or blot dry. Set aside. 6. Brush the dough with olive oil. Spoon on as much garlic cream sauce as desired. Then top with fontina, then potatoes, parmesan, and sprinkle with rosemary, coarse salt, and pepper. 7. Use a pizza peel or cookie sheet and slide under the parchment. Slide the parchment with the pizza into the oven. Bake one pizza at a time for anywhere from 5 to 10 minutes or until golden brown. Watch it carefully, it can turn from done to burnt in a minute. 8. Carefully remove the pizza and wait about 5 minutes before cutting. Meanwhile cook the other pizza and repeat. In a saucepan melt the butter and olive oil together over medium heat. Add the garlic and sauté for about 30 seconds until fragrant. Turn the heat to medium low and add the rest of the ingredients, but add the cheese last so it doesn’t hit the hot pan and seize up. Stir constantly until it coats the back of a spoon. Turn off the heat and move the sauce to a bowl. Sauce will thicken quite a bit as it cools. Recipe & picture by Laura Flowers with total inspiration from Linda @ Ciao Chow Linda. I am an admirer and follower of Michael Pollan's work. Thanks for sharing the clip! This looks like a fab pizza! I would love to see Michael Pollan speak! I'm a big fan of his work. Potato pizza is one of my favorite pizzas to make! Just curious about why you soak the potatoes overnight. I've never done it that way, so perhaps I'm missing out on something? To soften the potatoes enough so that they aren't crunchy. Linda soaked them until they were floppy and her method worked pretty well. Looks sooo delicious. The first time I had potato on pizza was in NY several years ago and I loved it so much. This is a great recipe--lucky for me tonight is pizza night! Laura - hopefully you don't mind but I am steeling your garlic cream sauce - I am making a reuben pizza tonight and I just wasn't in love with my sauce that I wrote out for it. I have been wanting to try making a potato pizza, and now I am going to commit. I love love love Micheal Pollen, and have read all of his books. It took me a while to get through omnivores Dilemma, and then the next two were fast reads. I saw a guy at the movie theater the other night reading a new one about being a locavore, and am going to look at reading being a purist. I seriously got into that this summer, hard to do in the winter though. Potato pizza looks amazing! I would love to try it sometime! Okay - this is the second Pizza with potatoes I've seen in as many weeks. What going on around here? I've never heard of such a thing before. I guess I'm just going to have to give it a try sometime. I am such a fan of Michael Pollan. I only wish he would come somewhere that I could hear him. Thanks so much for posting the clip. At my one year point as a food blogger I am making some changes on my blog that will reflect some of the very things Michael stresses. Your pizza looks wonderful. Thank you for this post! The potato pizza looks DELISH!! Great post. I am a fan of Michael Pollen. We too make potato pizza some times we add caramelized onions, or pesto. It’s the best. I've read Pollan's work, and was very impressed by his simple, practical advice. I'm not sure he might approve of the double carb pizza, but hey, it's food, and it's not too meaty, and we don't eat it all day! This pizza looks fantastic. Interestingly, I saw a potato pizza on "The Best Thing I Ever Ate: Pizza" on FoodNetwork tonight. Yours looks much lighter and fresher, though. The garlic cream sauce sounds amazing!! 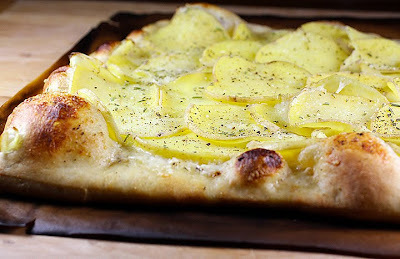 I love the idea of a potato pizza with a garlic cream sauce. The photos are so enticing! Thanks for the shout-out. Your version with that garlic cream sauce looks and sounds terrific. I am definatly going to have to try Potato Pizza! This must have been fascinating. I've used potatoes for pizza crust but have nothing in my file that matches the garlic sauce. Thanks for sharing this with us. ciao Laura!!! come va? spero bene!! Questa pizza è molto molto invitante!!!! chissà che buona!!!! complimenti!! Potato pizza was my favorite when I lived in Rome for a year, many moons ago. It was always made in a sheet pan, like you show it, and was available in what would then have been considered 'fast food' places. It's deceptively simple, and even more deceptively delicious! Molto grazie anche a Linda! Gorgeous pizza and good info about food... makes you think twice about raspberries in January! I too am a huge devotee of Michael Pollan's food sanity. His philosophies and books have inspired me to create an Edible Balcony on my 13th floor apartment in inner Sydney. It's my small way of encouraging city dwellers to reclaim their connection with the food they eat by growing it themselves. I've never thought of potato pizza - this garlic cream sounds like the finishing touch to this yummy dish! Nice pizza/ Pollan combo in this post. I'm a huge fan of homemade pizza and yours looks slammin! I thought I had the best pizza recipe until I saw this! Thanks for sharing with us. I love the idea of a garlic cream sauce. Fantastic. I was there too! I wonder if I saw you and just didn't recognize you. It was a fantastic talk, eh? I made my students read The Omnivore's Dilemma in a research writing course here at WSU, and I was happy to see a few of them when I entered the coliseum. That is awesome you got to see him speak - thanks for the facts from his speech! This potato pizza sure does look amazing!